When it gets dark, we use streetlights to light our way, but what if we could replace them with a greener alternative -- like glowing plants? Thanks to science, this unusual concept could one day become reality. A small biotech company in San Francisco is using genetic engineering to develop plants that emit their own light, CBS San Francisco reports. "We've developed a novel plant that glows in the dark using the latest tools and techniques that are known as synthetic biology," said Antony Evans, the cofounder of the company called Glowing Plant. The company's chief scientist Kyle Taylor has figured out how to add DNA to plant cells that causes them to produce the same chemical that makes fireflies glow. It has not been an easy process. "I must admit, the moment we could actually see it, and get over the visibility threshold was 1) a huge relief, and 2) 'Oh, thank God!'" Taylor said. The glow from the plants is too faint to see on video, but it can be captured with a still camera with a long exposure. "Really the goal of the Glowing Plant project was to create a product that symbolizes the advances that we're making and inspires people to imagine what else we can create," Evans said. But the project has its skeptics, such as environmental groups that have complained about the uncontrolled creation of these types of genetically modified organisms. "I think the conversation should be how should we use this tool rather than the knee-jerk reaction of, oh, it's bad, let's get rid of it," Taylor said. The company said its discoveries will be freely available to the public. 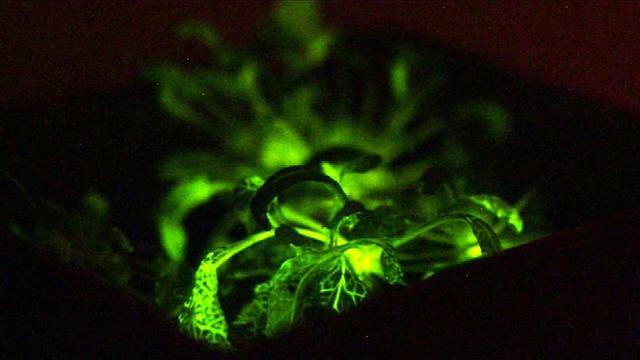 Glowing Plant has recently raised $400,000 in a Kickstarter public funding campaign.